You may remember late last year I was given the opportunity to review the newest fragrance from Katy Perry; Killer Queen. 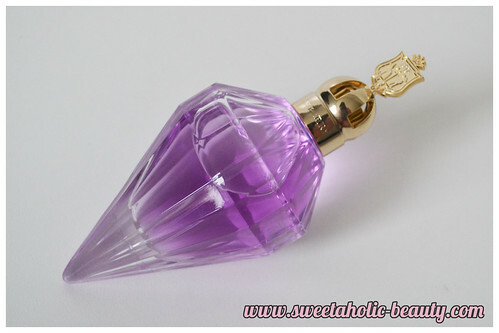 She's already back with another perfume in the Killer Queen range called Oh So Sheer. 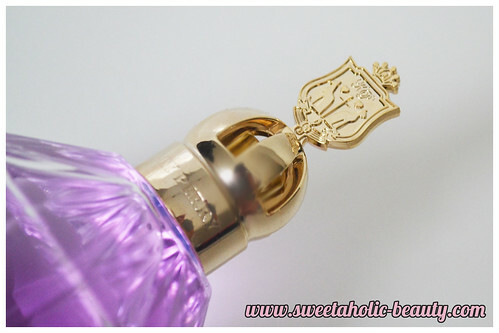 You can read my review on the original Killer Queen perfume here. I quite liked the original Killer Queen so I had high hopes for Oh So Sheer; which is cased in the same royal look as the previous perfume. As you can see, the bottle is identical to the first Killer Queen. I actually love when perfumes do this, because then it feels like you have the whole collection, and it looks nice and neat. Instead of being a deep red, we're faced with a gorgeous pastel purple. The attention to detail is absolutely gorgeous, much like the original Killer Queen. The scent of Oh So Sheer is truly lovely. With top notes of purple plum, elderberries, blackberries and mulberries the colour is definitely fitting. Middle notes include purple lilac, purple freesia, red velvet flower and rainbow plumeria; and bottom notes of cashmeran, natural patchouli heart and liquid praline. We're seeing a few repeat scents from the original Killer Queen, but the scent is definitely different. Unlike the original Killer Queen, I found Oh So Sheer to be far more wearable for every day occasions. Rather than being decadent and a tad heavy, I found this wore really lightly and had a happy-go-lucky feel to it. This is probably due to it being a nice fruity perfume. I would definitely recommend heading out to try Oh So Sheer. The scent is most definitely not for everyone, as some people may find it to be a little sickly. I personally will wear this year round and not just for summer/spring, as it gives me a smile every time I spray it! Have you tried Katy Perry's Oh So Sheer yet? If so, what are your thoughts? I love the original, and it sounds like I need to add this one to my perfume collection, too! This sounds quite light, but I'm not sure that bottle makes it the easiest to keep on my dresser! Wow that bottle is so pretty. This sounds like just my kind of perfume. Gotta go try it out. I'm your newest follower via google (1743).